The Hyundai A-League is back! I reckon this will be an exciting year for the league! The expectation's there... with new marquee signings (in particular those from Brazil - with no less than 13 samba boys spread across the competition's eight clubs! ), new franchise team, and bigger crowd! 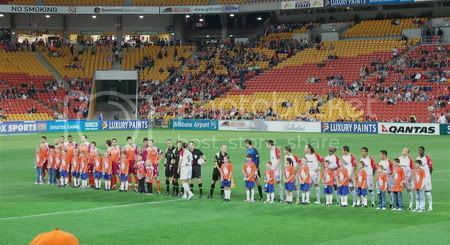 Anyways, few of us went to the first match of the season in Suncorp Stadium where home team, Queensland Roar take on Adelaide United! 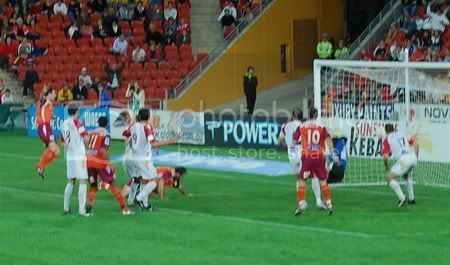 I was expecting a though match for Queenland as Adelaides' got a favourable record in Suncorp Stadium, unbeaten by the Roar in three previous meetings... and they had a pretty good pre season. The match sure did not disappoint. Equal chances on both side of the field and the highlight of the match was a disallowed goal for Queensland Roar and as expected, Queensland Roar captain and marquee signing Craig Moore was sent off for a second bookable challenge within 5 mins of each other! 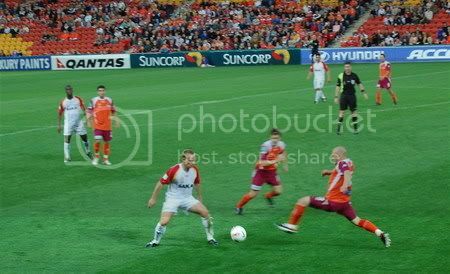 haha... but Queensland Roar still managed to fight back from being behind - twice - to grab a 2-2 draw with Adelaide United. I reckon the rest of the season will be tight... except for Sydney's lost to Central Coast by one goal, all matches ended in a draw.